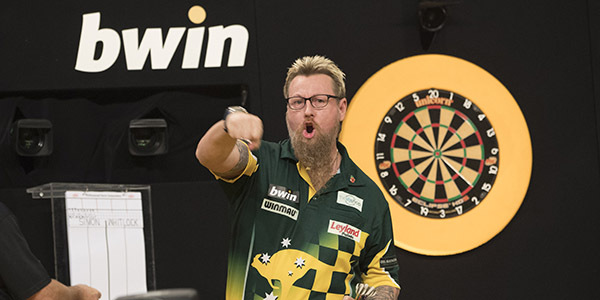 SIMON WHITLOCK produced a sensational comeback to defeat Gerwyn Price and become one of seven players to qualify for the knockout stage of the bwin Grand Slam of Darts on Monday in Wolverhampton. Day three of the £450,000 event saw the final round of group fixtures in Groups E-H, with the top two players from each group progressing to Wednesday's last 16 knockout stage. European Championship runner-up Whitlock, who needed a win to qualify from Group F, trailed 4-1 before landing a second 170 finish of the match and then survived two match darts from Price to claim a dramatic win. "I never give up, it's part of who I am as a person," said Whitlock, who averaged 108.86 to Price's 104.58 in a high-class affair. "I'm feeling so relieved to get through after that crazy game. It felt amazing to see the two 170s to go in. I'm feeling good at the moment and I want to keep this feeling going." Despite suffering defeat to the determined Australian, Welshman Price qualified as group winner, while the result also meant an early elimination for last year's quarter-finalist Durrant, who suffered a 5-4 loss to Andrew Gilding earlier in the evening despite averaging 104.98. Whitlock will now take on world number two Peter Wright, who topped Group E with three wins from three after his 5-4 victory over Josh Payne. Payne still qualified thanks to his superior leg difference over Max Hopp and Jim Williams, and the former World Youth Championship finalist will now face Price. German number one Hopp suffered a 5-4 defeat to Williams, but it still wasn't enough for the Welsh BDO qualifier to progress on his Grand Slam debut. In Group H, reigning World Youth Champion Dimitri Van den Bergh secured his progression to the last 16 with a 5-1 win over Mark McGeeney and he will now take on Group G winner Stephen Bunting. 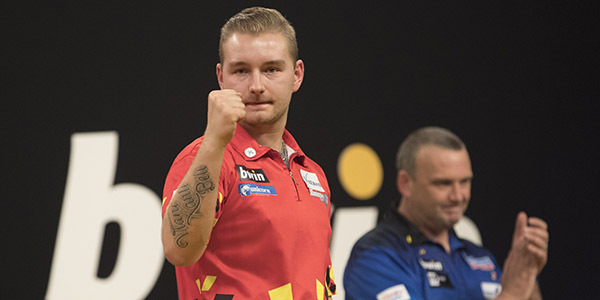 "Two years ago I won two group games but I lost in a nine-dart shoot-out, which was gutting, so I'm happy to get through this time," said Van den Bergh. "I'm in a good place, my preparation before games is going fine, and I have a lot of support from people around me. That helps me a lot." Rob Cross was already assured of his place in the knockout stage but his 5-2 win over already-eliminated Ryan Searle meant the World Champion went through as Group H winner, and he will now play Mensur Suljovic, who made it through despite suffering a 5-4 defeat to young German Martin Schindler. 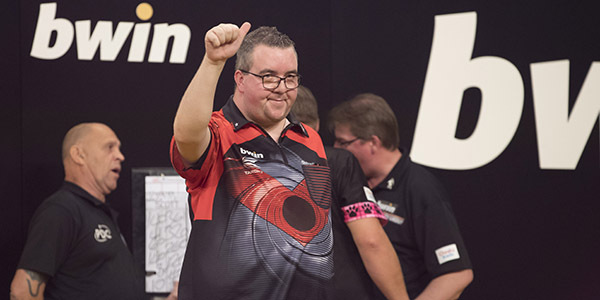 Bunting topped Group G with three wins out of three after his 5-1 success over Scott Mitchell in the battle of the former Lakeside Champions, a result which ensured Suljovic’s progression. The final group matches for Groups A-D will take place on Tuesday, before the last-16 knockout stage begins on Wednesday. The group stage concludes on Tuesday night with the remaining eight matches, headlined by a must-win tie for reigning champion Michael van Gerwen against Joe Murnan. Gary Anderson and James Wade, who have already qualified for the knockout stage, play eliminated duo Steve Hine and Mark Webster respectively. Ian White plays Germany's Michael Unterbuchner in a winner-progresses tie, while Keegan Brown and Wesley Harms contest another shoot-out. Jonny Clayton, who overcame Van Gerwen on Sunday night, plays Gary Robson, while 2012 champion Raymond van Barneveld take on unbeaten Michael Smith in crunch clash in Group B, where Krzysztof Ratajski takes on Adam Smith-Neale. The knockout phase then begins on Wednesday with the qualifiers from Groups E-H competing in the second round, with the players progressing from Groups A-D returning to the stage on Thursday.